Trapper AN8 Electric Fencing Energiser. 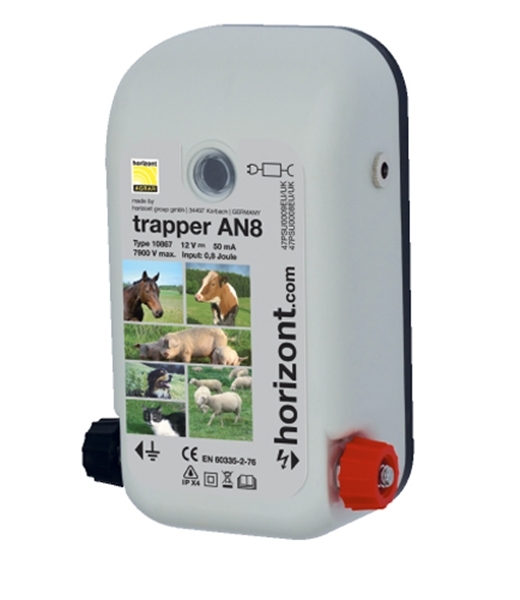 This electric fence energiser gives you the best of both worlds. It can be clipped on to a 12 volt battery and used to power a fence in the middle of a field. Plug in the provided adapter and the AN8 energiser is a mains powered unit with no more batteries to worry about. This gives the maximum flexibility so it can adapt to your changing fencing requirements. The energiser is made in Germany and is very easy to use, easy to install and reliable. It has a light to indicate that it is working and to warn you if there are any battery problems. The AN* powers up to 2.5 Km of electric fencing under 'realistic' conditions (up to 4 Km with perfect conditions). If you need more power, but like this model you can consider the AN12 (up to 8 Km) and AN24 (up to 12 Km). Please note, is is always best to have an energiser that can easily power your fence - if in doubt, go for a more powerful energiser. Mains and 12v in the same unit , so easy and at a very sensible price, plus with three in the range there is a unit to suit most requirements. If you are running it from a 12 volt battery, have you considered a solar panel to charge your battery for you? Please note: if you intend to use this as a mains energiser, you will need some lead out cable to run from the energiser to the fence.